I knew it’d be a mistake the moment it was over. He was a ghoulish old king. He’d extorted, terrorized, and murdered to fill his coffers. His brothers were thieves. His wives…both of them…were daggers in every man’s back. His subjects hated him. His enemies feared him. The ground he walked turned black beneath his boots. His bathwater reeked of death. Every family who’d even a chance at sniffing the throne, he’d exiled, poisoned, or butchered. When his cousin’s coup d’état failed, the ghoul burned the usurpers’ children alive, drowned his cousin’s mother, and hung the collaborators’ bodies from gibbets so high even the crows dared not a single sniff. It was time for the King to go. Everyone knew it. Everyone wanted it. His black towers had too long stood like knives on the kingdom’s throat. When the three exiles came to me on autumn’s second eve, I knew what they wanted. One carried a chest of silvers. The other dropped a satchel of ingots on my table. The third stood in my doorway, the moonlight shining on his back. He was a weathered, ancient thing. Twenty years in the sand had done him poorly. I smirked, my dagger folded against my wrist in case he did something stupid. “Lady Lusia, will you?” he asked. “Will I what?” I pretended not to know what he meant. “No.” I glanced out my window. I couldn’t see the black towers, but I knew they were there. “Why?” asked the weathered man. I got tired of waiting. I flicked my knife and split the three men neck to belly. They died quietly. Their blood drained onto the floor, but the night moved none at all. I knew it was a mistake the moment it was over. …but the Ghoul had paid me well. 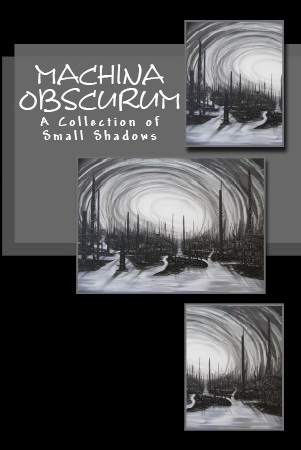 Machina Obscurum features a host of writers doing their best to darken your world with short, deadly stories and quick-as-knives fiction.